Jean M. Mahserjian, Esq., is a dedicated Saratoga divorce lawyer and family law attorney serving Albany, Saratoga, and the surrounding areas. For more than 20 years, Jean has maintained her capital region law firm, located on Route 9 in Clifton Park, New York. The practice encompasses all areas of family and matrimonial law, an online uncontested divorce service and various areas of estate planning. Jean M. Mahserjian, Esq., P.C. was founded more than 20 years ago with the idea of empowering clients to pursue what they viewed as the best remedies for their personal circumstances. Our clients throughout Albany and Saratoga County come to us with questions regarding their rights and obligations, the costs and benefits of different courses of action, and their chances of prevailing in legal disputes. By arming our clients with knowledge, we keep them engaged and in charge, directing the strategies we employ to deliver the relief they seek. 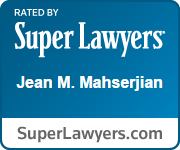 The dedicated Saratoga divorce lawyers at Jean M. Mahserjian, Esq., P.C. offer sound and reliable counsel on issues that impact your home, your closest relationships, your finances and your future. Whether we’re assisting you with a family law issue or helping you plan for your family’s future with our estate planning practice, our goal is to fully educate you on your options and help you make the best decisions possible. You’ll find our office welcoming. Our Saratoga County attorneys take the time to listen and thoroughly answer your questions. We firmly believe in educating you on the law, the process and even the tendencies of opposing attorneys and family court judges with whom we are familiar and enjoy mutually respectful relationships. If you are going through a divorce, our team of dedicated Saratoga divorce lawyers can help you and your family seek legal solutions that offer the best chance for an amicable, workable future. We provide a full range of divorce services, such as representation in uncontested divorce and no-fault divorce, negotiation or litigation of initial child support and child custody orders, spousal support and maintenance, property division, and enforcement of premarital agreements and postnuptial agreements. Our family law practice deals with the issues that arise outside of a divorce, including enforcement of child support and spousal support orders, visitation rights and interstate visitation, post-order modification, paternity, domestic relations, and adoption. We’re also known for our desire to help families through collaborative resolutions, seeking to handle disputes through divorce mediation and family mediation when possible. For those clients who are on a solid financial footing and wish to prepare for the future, we offer a full-service estate planning, trusts and wills practice to help them plan for their family’s future financial security. Jean M. Mahserjian, Esq., P.C. is available to provide legal counsel for life’s most crucial issues. Call us at (518) 383-1182. We will be happy to answer your questions and schedule an initial appointment at our Clifton Park office. You can also schedule an appointment by contacting us online.